It’s time to wrap up my month of apple recipes with what I think may be the best one…Apple Walnut Coffee Cake. I know I’m a few days late but this was too good not to share. Besides, better late than never. The best thing about this cake is, of course, the topping. You know how I love a good topping and this one is fabulous. I didn’t roast my walnuts but I think if you did it would add even more flavor. Butter or spray a 9 x 9 pan. In the bowl of a standing mixer combine the oil, eggs, sugar and vanilla. Add the flour mixture to the oil mixture alternating with the sour cream, beginning and ending with the flour mixture. Fold in apples and pour into prepared pan. Combine melted butter, brown sugar, cinnamon and walnuts. Sprinkle over batter. Bake for 45 min. or until pick inserted in center comes out clean. Honestly, if you left out the apples from this cake it would still be wonderful. The apples add a bit of texture and flavor but they get a little buried under that topping. This stayed moist for several days too so don’t hesitate to make it the day before if you are having company. We warmed it up in the microwave for a few seconds and it tasted fresh from the oven. I am joining some of my favorite bloggers in a few days for The Scoop on Creating Fall Vignettes. I have kept mine rather simple but the basics are all there. I can’t wait to share it with you! I just found your website and love it. Thanks for all your work and sharing. 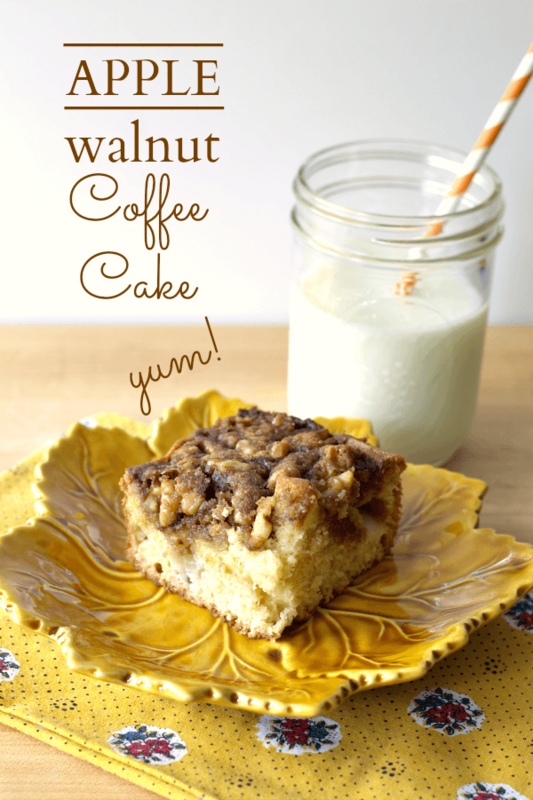 I plan to make the Apple Walnut Coffee Cake. Do you peel the apples? Yum, indeed! I think I’ll leave the apples in the recipe. Thanks for sharing! Oh YUM! LOVE this recipe Ann. You have a way of making me want to eat the photograph! That sounds and looks really good! I make one similar with the sour cream, but no apples. It is a moist dense cake.